Dan Williams has been running The Bottle Shop for just over 2 years on the corner of Pen-y-Lan Road in Roath. Nicole Rugman decided to have a catchup with Dan and Watson (his chocolate labrador) to find out how they have been getting on. What’s the strangest beer request that you’ve ever had? I don’t get many strange requests for beers in the shop, maybe the odd eastern beer request from people who have been globe trotting but nothing I haven’t usually heard of. I’ve had requests for some of BrewDog’s highly alcoholic ales, in particular, Tactical Nuclear Penguin (32% alcohol) but it’s just too expensive to bring in for customers to buy. Christmas is usually an interesting time as people are frequently buying for relatives and request drinks for their Nan or Granddad. Some of the requests are for drinks that haven’t been in production for decades! What has surprised you the most about opening a real ale shop in Roath? The fact that demand for real ale is alive and well in Roath! Beer was my first love and I’ve had a wish list of beers that I’ve wanted to sell for a long time. 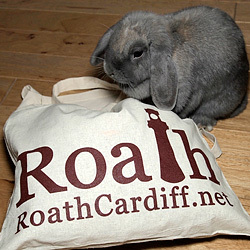 Being able to share those beers with Roath residents and visitors to the area has been great. The diversity of my customers’ tastes is always surprising as well. I’ve got some regular older customers who buy the newer craft ales with the fun packaging from Partizan or Weird Beard breweries and then younger customers who will inquisitively pick up the more traditional ales such as the Augustina beers. Customers love the range of ales of offer and I enjoy listening to people making personal recommendations in the shop. How much alcohol has Watson accidentally swallowed? He’s not much of a drinker to be honest! He tends to sniff at whatever’s around and walk away. He does like the corks to play with though, especially champagne corks. He’s got expensive taste! How much, do you think, has Social Media helped with sales? In regard to beer sales alone? Massively! If I post a photo of some new beers that have been delivered to the shop on Twitter or Facebook, customers usually respond online instantly and then pop in within 1-2 days to buy some. Wine, on the other hand, doesn’t have the same effect. I don’t think wine drinkers are any more or less on social media but there isn’t that engagement that you usually get from beer or cider. Maybe you need more than 140 characters to sell a wine properly on Twitter? I’m not sure but I would love to engage with wine aficionados in the area. Definitely word of mouth. I frequently hear from customers who say that their friend / neighbour / colleague has recommended the shop. They always come back too. That and social media are where most of my customers come from. What’s your personal favourite beer / cider / wine that you sell? Dan walks around the shop and pulls various bottles from the shelves. For beer, it has to be Handwerk’s All Day IPA. It’s unpasteurised, unfiltered, vegan friendly and easy drinking. My favourite cider is TyGwyn from a brother business partnership in Monmouthshire. This stuff is 100% apple juice made by one person with Dabinett apples. When it comes to wine I love blends as they’re inherently rich. Chateau Fontârèche Corbières gets my vote for its blend of 4 grapes in a bottle. I would like to expand and open a second shop, especially to help with hosting events as I’m running out of space in my current location. I had an idea to buy a second hand double decker bus and do it up as a mobile venue for wine tasting but sadly I don’t have the parking space for one. I really liked Bar En Route in Cathays when that was open so I would like to be able to start something like that in Roath. What’s your favourite Roath pub for beer? I’d probably go to the Andrew Buchan for a couple and then head to The Albany. [email protected] / 029 20490096. You can follow The Bottle Shop on Facebook and Twitter.